Max’s Muscle Gain Stack. Save $51! The Max’s Muscle Gain Stack has been design to provide the tools you need to make massive bulking gains. 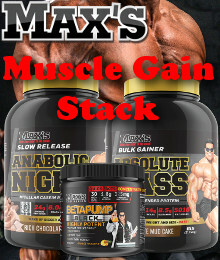 Each stack contains Max’s new Absolute Mass high calorie mass gainer with a blend of protein, carbs and amino acids, Anabolic Night slow release protein for sustained release of up to 8 hours and Betapump Black vasodilation pre workout for energy, focus and muscle pump. MAX’S Absolute Mass will help you build impressive muscular size FAST. 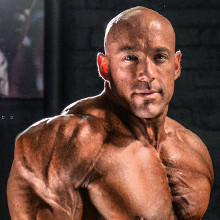 The secret to building Mass and Strength is training hard and heavy, plus making sure you get enough protein to grow muscle and enough carbs and fats to fuel recovery and growth. You need a diet that provides these nutrients all day so you keep growing, and that’s why Absolute MASS is so good. 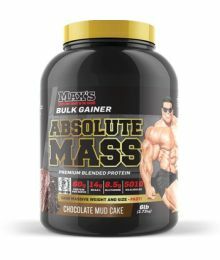 Our Blended Protein and Blended Carb formulation provides a fast and sustained release of MASS building nutrients that complements your diet to keep you anabolic all day. Added Branched Chain Amino Acids help stimulate mTOR to turn on protein synthesis while Glutamine stop you going catabolic. Max’s Anabolic Night is Australia best-selling night protein. It provides up to 8 hours of continuous protein release to keep you recovering and growing all night. Up to 60% of new muscle growth occurs while you sleep – if you give your body the right nutrients. Don’t waste your hard hours in the gym with poor night time nutrition – Use Anabolic Night and wake up bigger!